Sign up and receive notifications of new posts, updates and weekly fashion to your inbox! 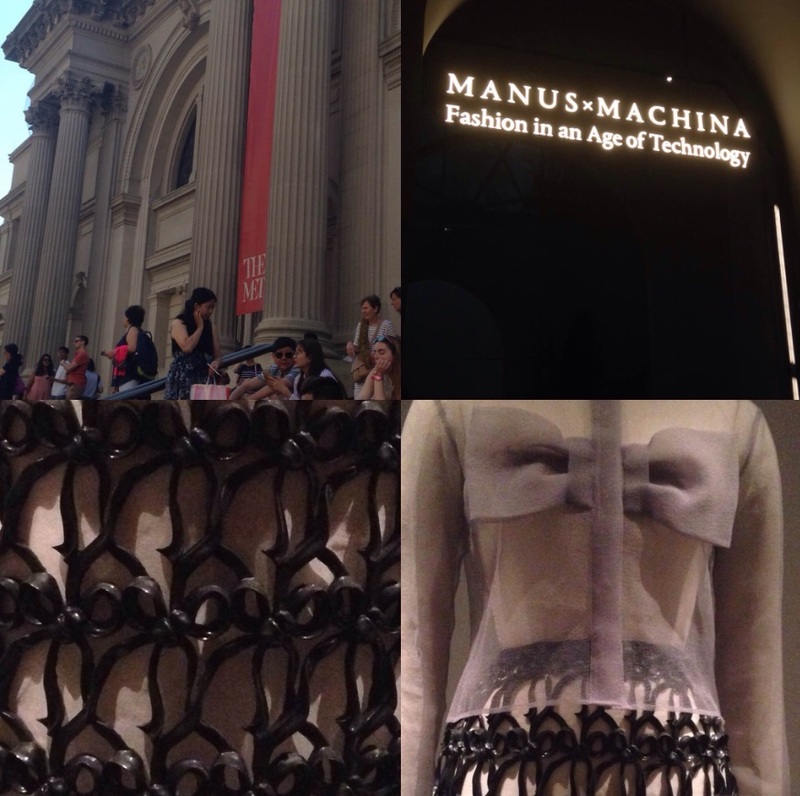 Manus x Machina: Fashion in an Age of Technology AND a surprise! So a few weeks ago I was able to find time on my crazy business trip in NYC to visit the famous Metropolitan Museum of Art! 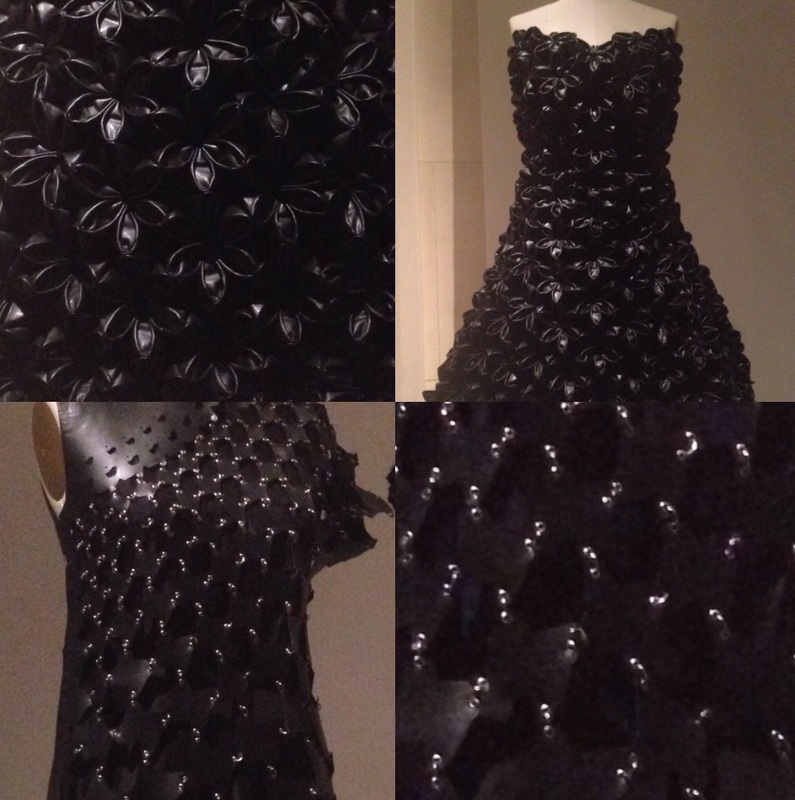 And of course I had to go see the ManusXMachina: Fashion in the Age of Technology exhibit! How could I come all the way to NYC and not go see it? Last summer, I was able to see the Met’s exhibition of China: Through the Looking Glass, which was equally amazing! The exhibit was breath taking! There was so much to see and admire. 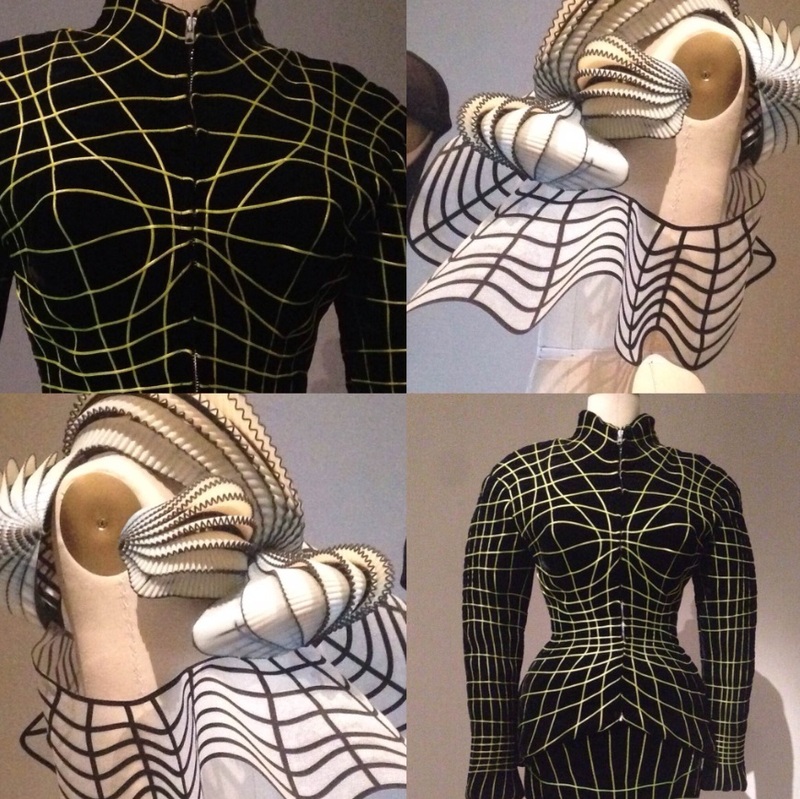 Some of these designs were 3D printed, others were a work of art in their complex design and linear structure; there were all feats of fashion. I, myself love the linear looks below, they reminded me of the movie Tron. While some of the others were the Elizabethan concept of tight pleating and twisted it into geometric shapes. It was incredible. And then there was the tiny texture and detailing. My photos really do not do these dresses any justice. In person there was just so much more you could see, even the tiniest details made a huge impact. This texture below looks like tiny flowers. I cant even fathom the amount of hours these design took to bring to life. If I were to guess it would be over 100! If not more! And of course there was other art to admire! We did end up spending the entire day at the Met! 6 crazy hours (it was a Sunday after all) of walking through those halls filling my mind with inspiration! Its clear I am drawn towards bright colors, bold graphics, hard lines and shape! 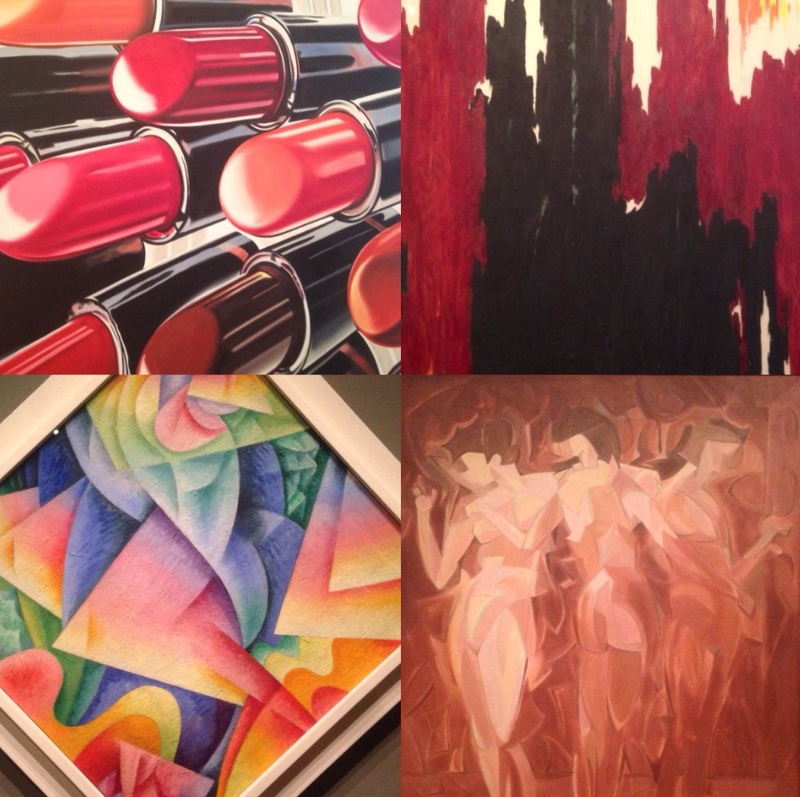 And I must say I was just drawn to this painting of lipstick. What you cannot tell from my photos, is each of the paintings below are easily at lest 10×10′ Feet! They were huge! If the art wasn’t inspiring enough, what I didn’t mention was before we went to the Met, we started off our day at Starbucks, my favorite coffee house. I had just worked through most of my business trip and finally had a day off! It was our last day in NYC and I was not going to miss the Met exhibit. However, little did I know when we got to that Starbucks my life would change! My boyfriend of 5 years usually accompanies me on my NYC business trips. Although finding time to spend together with a crammed work schedule is a bit challenging, we find the smaller moments together to make it count. Like getting pizza at 2am after a midnight showing of an AMC movie! (Which we did!). So needless to say when we sat down upstairs in Starbucks, I got the shock of my life. And you know how everything in NYC is vertical, and being upstairs in Starbucks allowed for more privacy for the two of us. And there it was! A beautiful, purple, skull (yes SKULL!) engagement ring!! 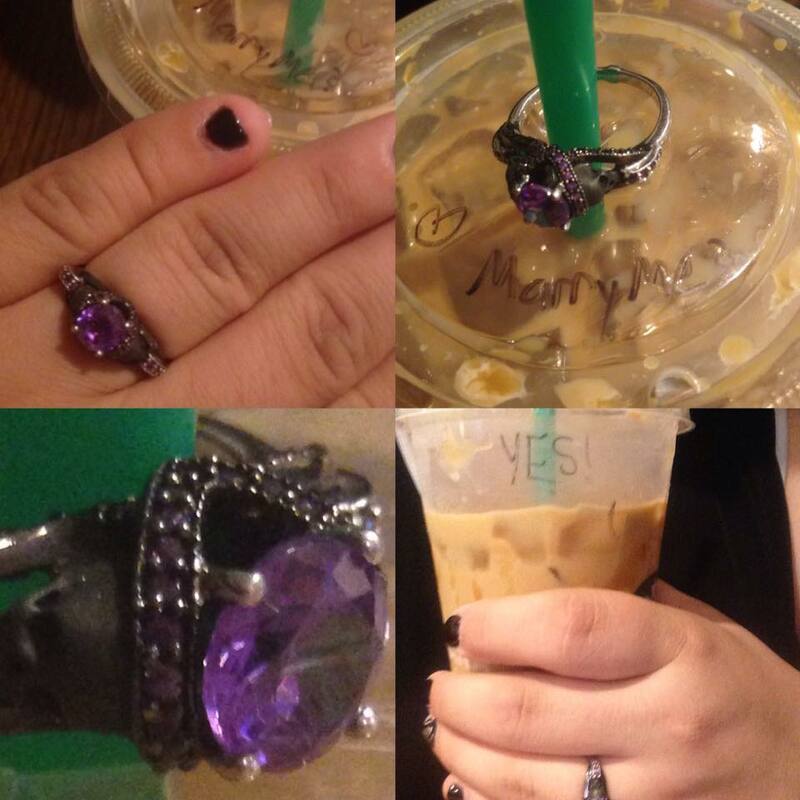 And right on the top of my cup were the words, “Marry me?” and of course, I just had to reply my response on the cup! I said YES! I was over the moon! And the ring fit!!! Which, I was super excited about, because I have huge hands and I was afraid it wouldn’t fit. (I did find out later the ring was a size 10, which was perfect!). I couldn’t wait to go home later that night and tell my parents and friends! This is surely one business trip I will never forget! Want to see what else I was working on while in NYC? Join my mailing list for my new jacket brand and company and get the behind the scenes look! Have a comment? Have you been to the Met? To NYC? I would LOVE to hear from you! With the happiest wishes and heart! Well its that time of year again- sickness spreads through my cube farm like the plague and everyone around you has an opinion about your sickness. Do this, do that, don’t do this, don’t do that.. etc. Regardless, whether you work in a cube farm like me, or just also get sick during the winter time, I made a list of some of me essential items I need when I am sick! First on my list is a pair of warm and fuzzy slippers! Now you probably shouldn’t wear slippers to work, but I do. Part of it is because they are warm and snuggly, partly because my slippers happen to also look like snow boots, and partly because I just want to. Granted I can only wear them on days its nice outside, IE no snow or ice. Other than that one snow storm, which melted pretty quick, the walk ways have been pretty clear and dry- allowing for slippers! My next thing on my list is tissues! Not just tissues, but Kleenex cool touch OR Scotties! It makes my nose feel so good! Scotties are extra soft, and Kleenex makes my nose feel cool! Needless to say, in sick season, and 2 sinus infections later, I have gone through easily 8 boxes all by myself. I couldn’t get through these colds without a crazy amount of tissues! Now that I am thinking about it, I wonder if they made more sustainable issue. I mean I could use a hankie, but I hate the feeling and idea of blowing my nose or sneezing into the same sticky and gross hankie. But maybe someone could come up with an idea where we have recycled issues or something of that nature? Hmm.. Speaking of running noses, my nose also gets all dried out and cracked- I end up looking like Rudolph the red nose rain deer! I always have a tiny bottle of Vaseline in my pocket! Its about the size of a quarter. It’s right in my make up bag and is a life saver- well lip saver! What else I also have in my pocket, is some Carmex! Ever since it started getting cold out, my lips dry out! The one of the worst things about having a cold is waking up and having your lip split right up the middle! Ugh I hate winter colds! Another item I couldn’t live without- and this is even without a cold, is Vanilla Chai tea! When I was in college I went through a phase where I didn’t want to drink coffee- I call it a phase because now I am back to drinking coffee on daily basis. But my roommate introduced me to this Vanilla Chai tea!- She even told me to add in a little honey and a drop of Vanilla Almond Milk, and you’re in business! And it was delicious! Now I keep a box of Vanilla Chai tea on my desk in the cube farm- it helps my get through the afternoon- and it especially helps me get through my sick days at work. What are your sickness essentials? I drink lots and lots of tea, but that’s because I don’t like soup! Stew sometimes I like, but not soup- I am not a fan of broth. I need things in the soup- like stew things- but I wont eat/drink just a bowl of broth. Yuck! I am also a huge fan of hot chocolate! Ever since Dunkin Donuts started carrying flavored hot chocolate- uh I can’t get enough! My favorite is the Smore’s! Now I can’t stop at Dunkin every day- because I am basically broke, but every once in a while is nice! Sometimes I even get a dunkaccino- which is perfect, because its a blend of coffee and hot chocolate! What more could you want! In the winter I tend to drink more hot beverages then cold. Though I am a classic New Englander who will drink Ice Coffee in the winter. Don’t judge me. I also prefer Starbucks over Dunkin, If I am being completely honest. But ever since they removed most of the Starbucks from my area, leaving me only 1 completely out of the way to my 9-5, I tend to drink my favorite Starbucks coffee on the weekends. I guess I will live. It seems the east coast has survived snowmagedon- towards Baltimore got over 40 inches! That’s 3 feet! CRAZY! Well our 8 inches of snow in here in Boston is almost gone- keep bringing on those 40 and 50 degree winter day. Well, regardless if we have a real winter or not- stay warm and healthy my friends! © Copyright Rose Riot™ 2016- All rights reserved.